Abseiling - a great activity for individual challenge and personal development. Suitable for most ages (we have worked with 4 and 80 year olds!) and levels of fitness. We have an intro abseil wall based at the Pirongia Forest Park Lodge. 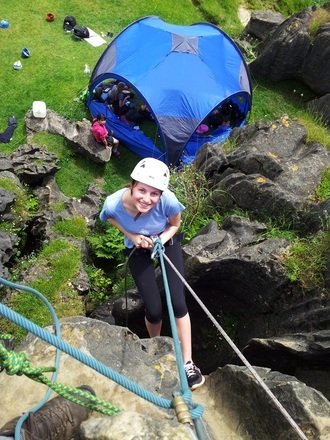 Why not come and have a try at abseiling "The Crack" at our own site - the picture shows a student about to enter a fissure and she will abseil down into a limestone shaft. A really fun and challenging abseil! We can also run training and assessment for Skills Active NZQA: National Certificate in Outdoor Recreation (Leadership) (Level 3) Abseiling.